We care about your health and your smile! We offer a convenient and cutting-edge concept to provide you with a fixed set of new teeth to last a lifetime. By means of a special surgical procedure and high-quality implants, we can provide patients who have already lost several teeth or who will soon lose them with a fixed set of new, permanent teeth – and all requiring only one operation. 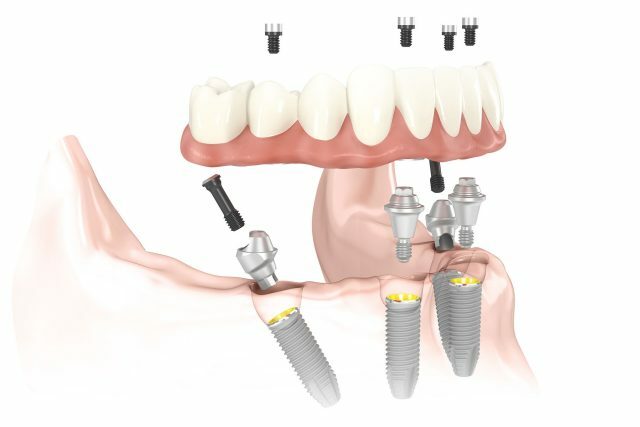 Four implants per jaw are usually all that is required to provide a stable anchor for a bridge (the All-on-4® method). Depending on the individual situation and the bone structure, between four and six implants are inserted per jaw. The number of implants is, however, only of minor importance; the main focus is on safely and securely anchoring your new teeth. As a result, it is often possible to avoid having to undergo intricate and time-consuming bone grafting beforehand. A firmly screwed bridge is then inserted just a few hours after the implant operation. You can start using your new teeth immediately after the operation. Before placing the implants, all operative decisions are carefully considered on the basis of three-dimensional planning. For this we use 3D images of your jaw (DVT). Custom-made navigation templates are used in the operation, which significantly improves the safety and precision of the procedure. Sensitive areas such as the maxillary sinus in the upper jaw are avoided and the risk of injuring nerves is reduced to a minimum. In the All-on-4® surgical method, the implants are inserted in the jaw bone at an angle of up to 30°. This allows us to make optimal use of your own bone, which often makes it possible to avoid time-consuming bone grafting. Special implants that have better stability in the bone maximise support in the jaw and allow you to start using your new teeth immediately. Long healing periods are also avoided. In our clinic, Dr Sebastian von Mohrenschildt is your contact person for all matters relating to the All-on-4® system and to immediate restoration and loading. If necessary, a short check of the surgical area is carried out on the following day. 7 to 10 days after the operation, we check how the healing process is coming along and remove the stitches. 2–3 weeks after the operation there is another check-up at our clinic. You will be given tips on how to look after and clean your new, fixed dentures. The final dentures will be adjusted to the healed mouth around 3–6 months after the operation. 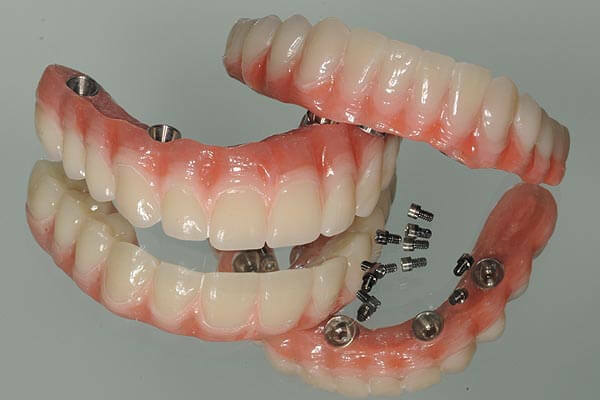 Dentures made of ceramic can be made for you upon request. Both the teeth and the implants must be subjected to regular medical examination and professional cleaning. You will therefore need to come to the clinic two or three times a year for professional implant cleaning (similar to dental cleaning). We also take out the bridge at regular intervals to carry out maintenance on the implants, during which the path of the implants is cleaned using a special powder. The “Fixed New Teeth in 1 Day” method is generally always possible. You leave the clinic on the same day with beautiful, fixed teeth. With this method you avoid long healing periods during which removable temporary prostheses would be used. You can avoid time-consuming bone grafting. Palate-free solution thanks to a custom-made bridge. Reduced number of visits to the dental practice.